If you are from my part of the hemisphere, you are probably familiar with the name 'Sunbrella', an outdoor fabric that withstands the wear and tear of our harsh sun. I have a very large outdoor umbrella made from this fabric, in fact it is so large I have nowhere to store it, so it is left out year round. Sunbrella fabric is fantastic, it has never gone mouldy or marked and at two years old, in all weathers it still looks like new. 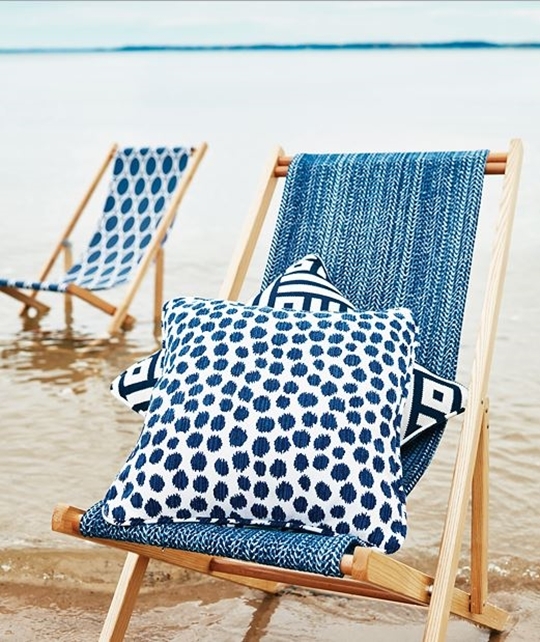 What has my umbrella got to do with the fabulous new designs from Thibaut you may be thinking, well the new Calypso range is indoor/outdoor fabric made from Sunbrella fabric. Thibaut's designs are always unique and their colour palettes beautiful so I was excited to see their new range which comes in various designs of circles, spots and geometrics, and includes my favourite colour, navy. The new range of fabrics can be mixed and matched. 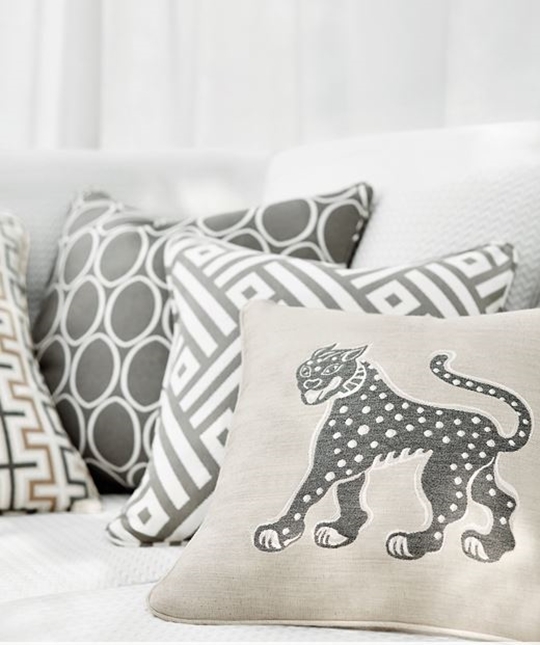 I am particularly drawn to Misha, the spotty leopard design which would make a great 'story' cushion. Sandy hues of beige and grey feature along with denim blue's and a ferny green that actually goes by the colourway, 'Kiwi'. As well as navy there is a marine blue and a softer spa blue. If those shades are too tame for you there is a bright Peony pink. All gorgeous colours, perfect for the beach house or city home. 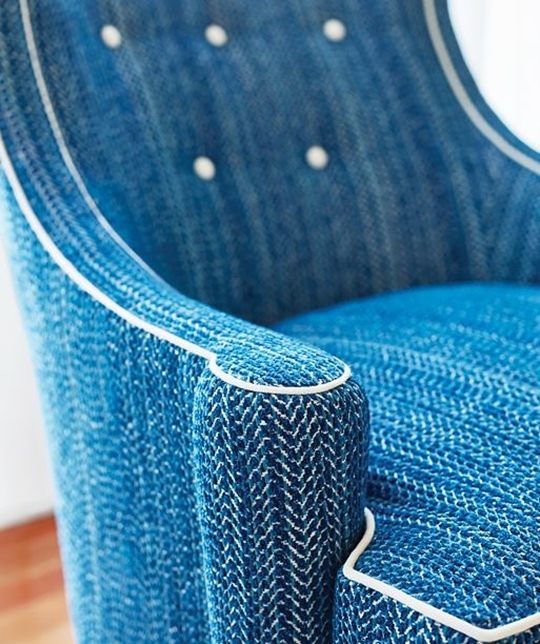 If you prefer a more colourful look, Thibaut's Portico range, also for indoor/outdoor use, incorporates coral tones. 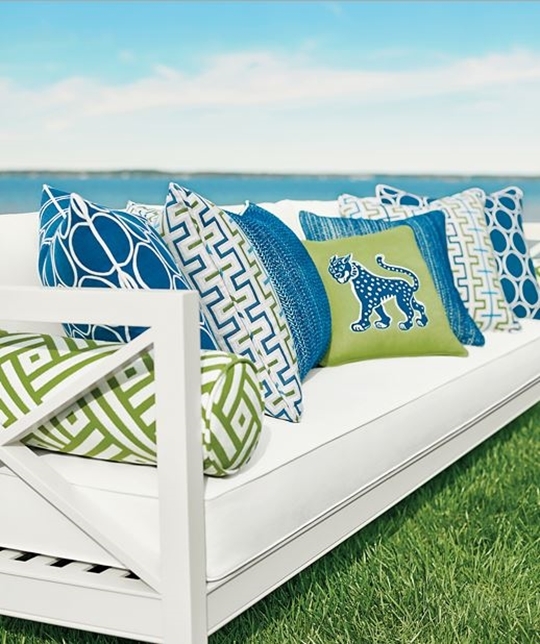 Visit Thibaut's website to view the full colour palette in their new Calypso range or Portico range made from the high-performance fabrics Sunbrella are renown for. "Vibrant, colourfast and stain resistant, offering long-lasting beauty and durability". If you have fallen in love with one or all of these fabrics (who couldn't), you will find your nearest stockist on Thibaut's website (link up above).